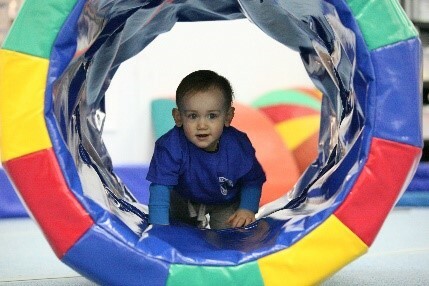 Our Kindergym classes are designed for children from 1 year old to school age and aims to develop their balance, co-ordination, gross and fine motor skills, special awareness and body control, while learning about colours, numbers, word association and social interaction, all in a safe and fun environment. Qualified British Gymnastics pre-school coaches are on hand to help and encourage the children and show their parents how to support them through their basic skills. The classes are 45 minutes long and consist of warm up games with hand apparatus and action songs, apparatus circuits to help develop their skills and to challenge the different age groups. There is a parachute game to bring everyone together at the end of a session. Qualified British Gymnastics pre-school coaches are on hand to help and encourage the children and show their parents how to support them through their basic skills. The classes are split into different age groups to enable the children to work at an appropriate level. Kindergym classes are required to pay an annual fee to British Gymnastics of £11.00 to cover membership to British Gymnastics which includes insurance cover. The earliest stage of our Kindergym programme involves a short warm up to introduce some simple movements and skills to nursery rhymes. The session is unstructured with the emphasis on exploring the gym, experiencing the benefits of the equipment to help them gain confidence as their balance and co-ordination improve. The next stage is more structured with a warm up involving hand apparatus games, basic skills and action songs. The apparatus circuits are designed to help children learn basic motor and gymnastic skills correctly and safely through the instruction of a qualified Kindergym coach. By now the children will have a good grasp of basic skills and be ready for further challenges. In the warm up more skills are taught and the apparatus circuits offer the opportunity to improve and develop these to a higher level, whilst still having enormous fun. These classes are for children who are just starting school. They bridge the gap between Kindergym and Club Classes offering the Kindergym class in a more structured and ‘parent free’ environment. Here they will learn to work in small groups with a qualified coach. All classes contain different themes and objectives each week.